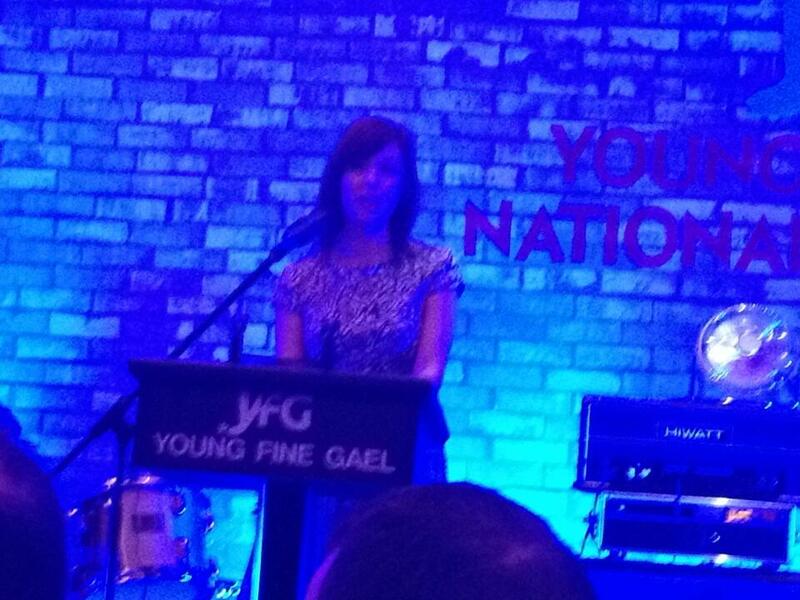 The Young Fine Gael National Conference was held in Waterford this weekend (22-24 November). National Youth Officer Sarah O’Connor invited me to give the pre-dinner speech on Saturday evening. Drawing on research from my new book, I spoke about a commitment by certain elements of Fine Gael to encouraging young members and formulating youth policies that pre-dated the formation of Young Fine Gael by Garret FitzGerald. My recent book covers a fascinating, if sometimes turbulent, period in Fine Gael history – the period between 1964 and 1987. Going into the project I was well aware of the relationship between Garret FitzGerald and Young Fine Gael, and having worked at UCD, of the existence of a youth branch there that pre-dated YFG. But as I began researching the earlier years covered by the book, I was struck by the awareness among certain people of the need to incorporate youth more fully in the party. It was former Taoiseach John A. Costello who suggested in 1961 that ‘if the Fine Gael party is to survive it can only do so by attracting the younger people in the country’. Over the next two decades in the party’s development, there was a conscious effort to attract and appeal to younger members (eventually culminating in the formation of Young Fine Gael). It is hardly coincidental that one of the most influential and inspiring Fine Gael figures at this time was John A. Costello’s son, Declan. Elected to the Dáil in 1951 at the age of 25, he penned his Just Society proposals just over a decade later. The content captured the spirit of the 1960s: not only was there a generational shift in Ireland, as those of the revolutionary period were replaced by new TDs with no connection to the independence struggle, but also internationally there seemed to be a culture of youth. Of course, in the last few days we’ve heard much about the person who arguably best encapsulated that image: the late John F Kennedy. I need not dwell on the image that he projected. Youth policy received greater attention from policy makers in the 1960s. During that decade the National Federation of Youth Clubs and the National Youth Council of Ireland were established in 1961 and 1967 respectively. Ireland’s youth population was expanding during that decade at a rate that could not be ignored. Between 1961 and 1971 census figures for the age category fifteen to twenty-four show an increase of just over 23%. Declan Costello’s signature document, Towards a Just Society, contained a section outlining a national programme for youth, the longer-term impact of which I’ll come back to momentarily. But it wasn’t just that Costello had incorporated youth policies into his document, but also that the document itself seemed to promise so much. Change appeared to be on the agenda in a very real way. In the introduction, Costello acknowledged the importance of 1916 and subsequent events, but – much like message Frank Flannery would communicate to a demoralised Fine Gael after the devastating 2002 general election – Costello emphasised the importance of looking forward. And in his original proposal circulated to the parliamentary party, he had argued that the adoption of his policies would allow Fine Gael to claim its place in the party system. What he offered was a defined set of policies, presenting the party was an opportunity to step out of the shadows of Fianna Fáil. And with minimal references to Fianna Fáil in the document, it provided the substance for Fine Gael to define itself as something other than Fianna Fáil’s main opposition. It was this type of approach that John A Costello had in mind in 1961. Declan Costello’s proposals cleverly labelled ‘A Just Society’ – echoing the language of Lyndon Johnson’s Great Society in America – inspired a new, young generation, bringing people like John Bruton, Gay Mitchell and Alan Dukes into the party. And when Costello announced his decision to retire from politics in 1967 – a decision subsequently reversed in 1973 – the extent to which he was admired by the party’s youth was reflected in a statement urging him to reconsider that was signed by many of those new members he had inspired. To step back a year: the 1966 presidential election also showed the influence of Costello. As we all know, Fine Gael came tantalisingly close to defeating the incumbent Eamon de Valera in that election. Part of the reason why was that Fine Gael offered a new type of candidate. Tom O’Higgins was the youngest yet to contest the presidential yet, and his campaign was built around the theme of youth and vitality. The results, in the words of Colonel PF Dineen, the party’s then General Secretary, ‘narrowed the gap so drastically’ that it ‘astonish[ed] many of our own supporters and confound[ed] the opposition’. It built on the momentum of Costello’s appeal, and Fine Gael appeared to be the party of youth. Of course, it wasn’t all plain sailing and I don’t want to create the impression that value of youth was always warmly embraced. As many of you will know, Declan Costello had to fight hard to convince the leadership to adopt his policies in 1964, and the then party leader James Dillon denigrated what he called ‘young men in a hurry’ in his leader’s speech at that year’s Ard Fheis. The label of ‘young tigers’ so frequently attached to Costello and his supporters is actually misattributed. The man Dillon actually had in mind was Gerry Sweetman – Costello’s great rival and the man who did the most to prevent Fine Gael from adopting the Just Society. The Just Society remained an untested document as Fine Gael stayed on the opposition benches after both the 1965 and 1969 general elections. By 1973, the Labour Party had reversed its anti-coalition stance that had been in place since the end of the Second Inter-Party government in 1957. Together with Fine Gael in 1973, it formed the National Coalition government in which John Bruton was appointed parliamentary secretary, as junior ministers were then called, to the Minister for Education. He was responsible for researching and piloting a youth policy that had much in common with what Costello had outlined in the 1960s. Bruton’s proposals marked the first serious attempt to frame youth work within the broader educational and community structure. The spending power of the National Coalition, which was in government between 1973 and 1977, was severely affected by the oil crisis resulting from the Arab-Israeli War that occurred shortly after they took office and the global economic downturn that followed. In attempting to convince the Department of Finance to sanction the spending necessary for his programme, Bruton argued that such a youth policy – approved by the National Youth Council – was sure to attract votes from that demographic. The coalition lost power, however, before it could be implemented. Intriguingly, while the incoming Fianna Fáil government commissioned its own research, the ultimate findings had much in common with the Bruton report. Thus by the time that Garret FitzGerald succeeded Liam Cosgrave as party leader in 1977 and subsequently set the wheels in motion to create Young Fine Gael, there had clearly been a keen awareness within Fine Gael that the country’s youth needed to be encouraged into politics and that specific policies needed to be formulated that would appeal to them. I’ll finish with a very apt observation from Jim O’Keeffee: Declan Costello was a ‘John the Baptist as far as Garret was concerned’. The political contribution of Declan Costello and Garret FitzGerald is explored more fully in my new book recently published by Palgrave Macmillan. (Click image to purchase via Amazon).